London Marathon 2018: could Nike Zoom Vaporfly Elite Flyprint finally break the two-hour barrier? Want to run like an Olympic champion? In a sense you now can, as the exclusive, 3D-printed Nike Zoom Vaporfly Elite Flyprint, will be available to buy, after it makes its bow in this Sunday's London Marathon. 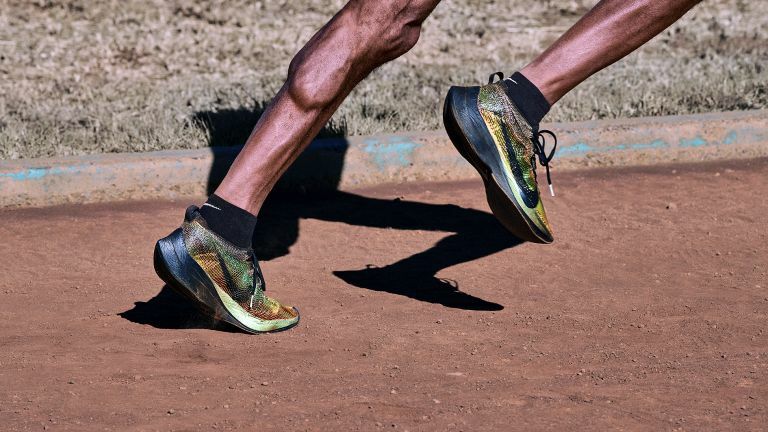 Elite, gazelle-like runners including current Olympic Champion Eliud Kipchoge will wear the shoe as they race, with the goal being to crack the two-hour mark for the first time. In the unlikely event they succeed, it will be a remarkable demonstration of human endurance and footwear engineering. Especially as the champ will be being pursued by people wearing inflatable sumo costumes, football team mascot outfits and/or dragging a fridge. The shoe is the successor to last year’s Vaporfly Elite, developed for Nike's 'Breaking2' project, and the first appearance of the brand's latest textile innovation, Nike Flyprint. For this shoe, the upper is 3D-printed – a first in performance footwear, we are assured – "to the exact specifications of elite athletes by listening to their feedback – accelerating innovation to accelerate athletes." Naturally, bespoke 3D printing allows increased customisation, but it also means new ideas can be very rapidly prototyped and tested as the engineers and athletes seek to shave off the remaining minutes and seconds required to break 2 hours (there's actually a full two minutes and 57 seconds left, so actually reaching that mark will be somewhat less instantaneous than the shoe printing, we suspect). The Vaporfly Elite weighed next to nothing, but this new Nike Zoom Vaporfly Elite Flyprint, despite taking much longer to say, is actually a full 11g lighter. Responding to feedback from users of the older shoe, the Flyprint also has greater breathability and decreased moisture absorption. If you want to have a go yourself at running 26.219 miles in 119 minutes 59.999 seconds, the Zoom Vaporfly Elite Flyprint will be available in limited quantities on the Nike and Nike SNEAKRS apps, from Sunday. We don't have details of pricing, but last year's Elite shoe was £200, and it's not likely to be cheaper than that. Also, sizing will be standard, rather than the shoe being 3D printed specifically for the exact size and shape of your foot. You'll have to train a bit harder if you want the full Elite package.